Innex joins in at this year’s Toy Fair to exhibit its exclusively-distributed brands Stubbins®, Retro-Bit®, and its newest addition to be introduced: Pixel Frames®. Toy Fair 2019 will be held in New York at the the Jacob K. Javits Convention Center. Visit Innex at booth #5578 in the 1D Lobby and be one of the first to see our upcoming products! Stubbins® will be introducing all-new gaming characters that are set to release this year. Some of which come from Bethesda®, Sony®, Bungie®, and Capcom®. Retro-Bit’s 2018 release of the Go Retro! Portable® as well as the Super Retro-Cade® will be showcased and demoed at the Innex booth for attendees and companies to play. PLUS - The newest brand that will be exclusively distributed by Innex, Inc.® is Pixel Frames which captures your favorite retro-game scenes in intricate and officially-licensed collectible shadow boxes to bring the iconic snapshots to your home. 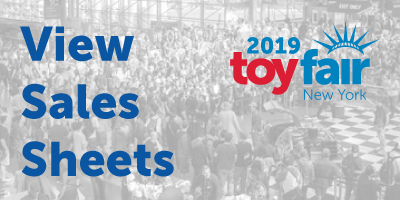 To find out more information, view the Toy Fair 2019 press release! The global toy community gathers at Toy Fair to buy and sell product, pitch and exchange ideas, meet with partners, and so much more. - Make connections with global toy professionals. - See and gain insight of toy trends both on classic and the latest tech toys. - See what’s new and what’s to come from over 1,000 toy companies! You’ll be able to meet and network with press, licensors, sales representatives, designers, inventors, and attend special sessions that focus on licensing, retailing, global research, safety, compliance, environmental issues, and more! Looking to meet with our team while at Toy Fair? Please include all your information and details in your e-mail to verify a proper meeting time. Or e-mail the details to jasminek@InnexInc.com.